Catalogue of Compact Discs etc. and all the music books are now available in PDF format also downloadable. The prices for these are a lot less and you will receive them by email in minutes instead of days or weeks. The new CDs & Music books numbers 56, 57, 58 and 59 are now available. 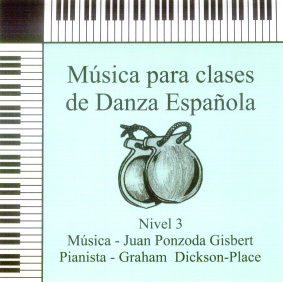 Also we are proud to present the third CD composed for your Spanish dance classes. The CDs represent real value for money. Unlike many other CDs on the market, these contain an average of over 50 original pieces of music. The CDs are of the highest quality, individually produced and tested to DDD quality. Each CD contains a wide variety of musical styles. In fact all the styles you need for ballet classes or Teachers' Examination. The music is composed to suit all ages and, to help you prepare your classes, comes with a detailed index. or CDs which contain collections of musical styles. If you would like to see the exact content of any of the CDs, please go to the indexes page. The music is beautifully printed, not hand-written. The ordering codes for sheet music are: GDPMUS1, GDPMUS2, etc. CD No. 56 contains 51 inspiring and enjoyable pieces of music which can also be used as alternative music for the Advanced Foundation syllabus. CD No. 57 contains inspiring and enjoyable pieces of music which can also be used as alternative music for the new Intermediate Foundation syllabus. CD No. 58 contains 24 extended pieces of music in various dance styles suitable for your end of year performances. We are proud to offer you three excellent compact discs and music books composed specifically for the very first classes in Spanish dance. 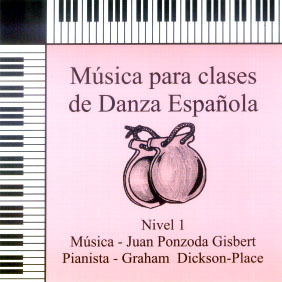 They contain music for exercises in both the Bolero and Flamenco styles (Levels 1, 2 & 3). CDs numbers 22, 23, 29, 30, 45, 46 & 50 will make your Grades syllabus classes more enjoyable. at least double the amount of music has been recorded. CDs numbers 11, 14, 18, 32, 35, 48 & 51 will make your Vocational syllabus classes more enjoyable for you and your students. DVD No. 47 is a completely new idea. This DVD shows a selection of allegro steps which students should know at a basic vocational level. It explains their correct names and execution. The steps are shown at normal speed and in slow motion. This is a 'must' for new teachers or for teachers preparing students for exams. It will help a lot with the preparation of 'un-seen' or 'free' exercises. CD No. 3 contains music for two complete classes at Pre-school level (Baby class). 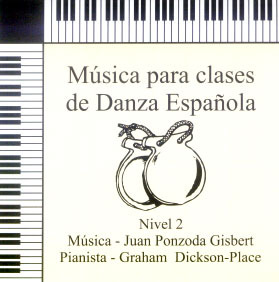 This music was written in conjunction with a famous Spanish ballet teacher and is accompanied by written out exercises (optional). (Ordering codes - gdpcd3a - with exercises and gdpcg3b - CD only) Detailed index of CD No. 3. CD No. 12 Like CD number 3, CD No. 12 is specially designed for baby class. It contains 48 delightful pieces of music (more than 50 minutes of music). Also like CD number 3, there is an accompanying book (optional) which contains specially choreographed exercises and action songs. CD No. 25 contains 35 pieces of original piano music for a class at Pre-school level. It is accompanied by suggested exercises (optional) designed for baby class. (ordering code - gdpcd25a with exercises, gdpcd25b without exercises). AT LAST! A BABY CLASS DVD! ARE YOU LOOKING FOR POLKAS, WALTZES, HABANERAS ETC. FOR YOUR FREE CLASSES? 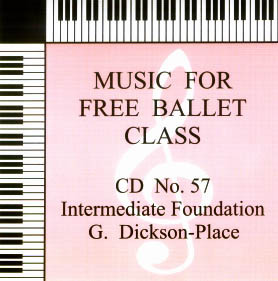 The following CDs contain hundreds of original pieces of piano music arranged in musical styles. CDs Nos. 5 & 6, are, by popular request, collections of pieces of piano music arranged in groups of musical styles, rather than in the normal order of a free ballet class. CD No. 5 contains 15 pieces for Adagio/Ports de Bras, 9 Allegros in 2/4 time, 8 Allegros in 6/8 time and 22 pieces in various styles and rhythms - 54 in total. CD No. 6 contains 9 Viennese waltzes, 12 lyrical waltzes, 12 big waltzes and 27 pieces of music in the various dance rhythms - 60 in total. Detailed index of CD No. 5. Detailed index of CD No. 6. CD No. 7 consists of a collection of original piano pieces, in the style of the very popular numbers 5 and 6. It contains 12 Adagios, 11 allegros in 2/4 and 6/8, 16 Waltzes ranging from 'Lyrical' to 'Big', and 12 pieces in various styles. In total, 51 tracks lasting over an hour. (Ordering code - gdpcd7) Detailed index of CD No. 7. CDs Nos. 9 & 10 follow along the line of CDs 5 and 6. CDs 9 & 10 make up a collection of music in all the popular musical styles normally used in daily ballet classes. Between them they contain 111 pieces of original piano music. CD No. 9 is made up of 15 Adagios, 11 Allegros in 2/4 time, 10 Allegros in 6/8 time and 19 pieces in various styles and speeds - 61 minutes in total. CD No. 10 contains 11 Viennese waltzes, 7 Lyrical waltzes, 19 Grand waltzes and19 pieces in various styles and speeds - 64 minutes in total. CD No. 31 contains 49 pieces of original piano music arranged in groups of musical styles - Adagios, Waltzes, Allegros, etc. Detailed index of CD No. 1. Detailed index of CD No. 2. LOOKING FOR MUSIC FOR YOUR END-OF-YEAR PERFORMANCE? CD No. 16 contains 24 extended pieces of original piano music in the form of dances in a wide variety of styles. It is accompanied by suggested dances (optional). (Ordering codes - gdpcd16a - with exercises and gdpcg16b - CD only). NEED TO WARM-UP, STRETCH OR RELAX? CD No. 43 contains 24 pieces of original piano music especially composed for 'Warm-up and Stretch' sessions. AT LAST! A DVD SHOWING HOW TO WARM UP AND STRETCH CORRECTLY! CD No. 17 contains 27 pieces of original piano music suitable for Character exercises and dances. It is accompanied by suggested exercises and dances (optional). (Ordering codes - gdpcd17a - with exercises and gdpcg17b - CD only). CD No. 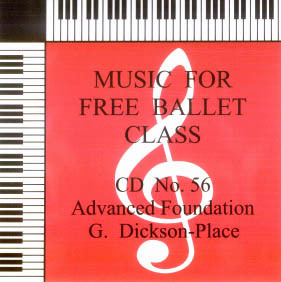 20 contains 50 pieces of original piano music suitable for your pointe work classes. It is accompanied by suggested exercises for early pointe work training (optional). (Ordering codes - gdpcd20a - with exercises and gdpcg20b - CD only). CD No. 21 contains 56 pieces of original piano and, along with the accompanying notes, forms a music course designed to improve the musicality of young dance students. Over the years musicality has been, to a large degree, ignored. There has also been very little help given to dance teachers on the subject. This CD is designed to help redress this situation. Graham has travelled the world giving music courses to teachers and students. All his experience has been channelled into this CD. (Ordering code - gdpcd21 - with exercises). There is a special price if you order CDs 21, 36 & 38 together. CD No. 26 contains 47 pieces of original piano music and accompanying teachers notes (optional) in the form of free centre-work exercises. These exercises are similar to the free exercises in major exams. (ordering code - gdpcd26a with exercises, gdpcd26b without exercises). It is accompanied by suggested exercises for slightly more advanced pointe work training (optional). The ordering codes are - gdpcd33a - with exercises and gdpcd33b - CD only, or if you would like to order the DVD, gddvd33a - with exercises and gddvd33b - DVD only. CDs Nos. 36 & 38 Is a new idea! It is basic music theory course in the form of a book and CD. This is a must for those of you who would like to know more about music theory especially if you are preparing yourself for a teachers exam. It contains a step-by-step explanation of essential music theory with over 50 written and recorded simple music examples to help you. There is help on understanding Simple and Compound time, how to count the various time signatures, etc. It contains advice on constructing and marking exercises and explains all you need to know about the dance rhythms. This course is based on Graham's 30 years of experience working with dance teachers. There is a special price if you order CDs 21, 36 & 38 together. Detailed index of CD No. 38 The ordering code is - gdpcd36 & gdpcd38. To order any of the CDs and/or printed music, please visit the 'How to order' page. Generous discounts apply for purchases of more than two compact discs or DVDs. Due to mailing costs there is no discount on the music books.